Rotary Club of Newcastle-under-Lyme - Welcome! 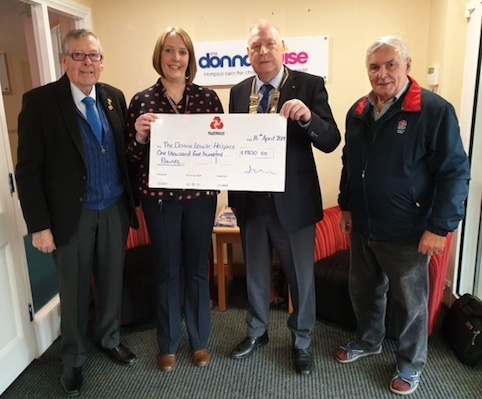 Following the 90th Charter Concert at Longton Central Hall, where the award winning choir, The Daleian Singers and guests performed to raise funds for one of our chosen local charities, we were able to make a gift of £1500 towards the work of Donna Louise. Jayne accepted the cheque from the club and representatives from the Daleians. Tim Wedgwood our compère on the night extended his best wishes to Rotary and the Daleians for their future activities and the work done by Donna Louise. Pictured left to right are Joe Cartwright (Rotarian/Daleian singer), Jayne (Donna Louise), Paul Bradshaw (Rotary Club President), Gus Harper (Daleian Singer). On Tuesday evening, 15 May, we accepted a challenge to compete against the Rotary Club of Six Towns (Stoke on Trent) in the first round of the District 1210 Golf Croquet Tournament. Six Rotarians from our club formed our team, President John Scarpello (team captain); Derek Broom; Ron Lucas; Carol Reddish; Dagmar Rubin; and Peter Rolfe. We played in the delightful grounds of Queen's Park, Longton, on a former bowling green. And our team was successful.John Scarpello and Carol Reddish won their match 4-2, as did Dagmar Rubin and Peter Rolfe. The old men of the team, Past Governors Derek Broome and Ron Lucas only scraped through 4-3 in their match but the net result was a three matches to nil victory for Newcastle. The tournament was ably organised by Six Towns captain and President Elect Sandra Matthews and afterwards Six Towns generously hosted refreshments for everyone in the Park Inn nearby.A jolly good evening was enjoyed by us all and we agreed this was Rotary fellowship at its best. The Coffee Morning on the 3rd December organised by club member Krishna Argarwal raised £370 for 'End Polio Now'. 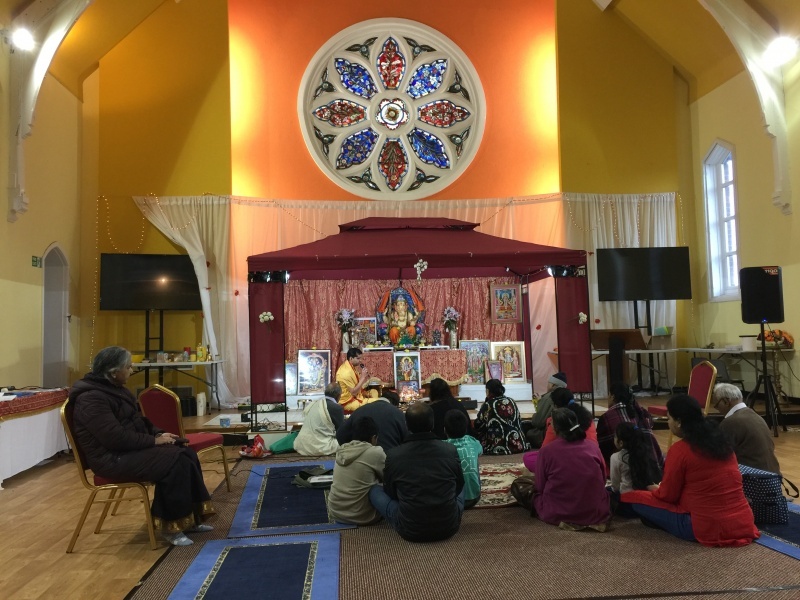 The event at the Hindu Temple in Hanley was attended by several club members, partners, friends and the congregation. Everyone enjoyed the experience which included an excellent traditional Indian lunch. 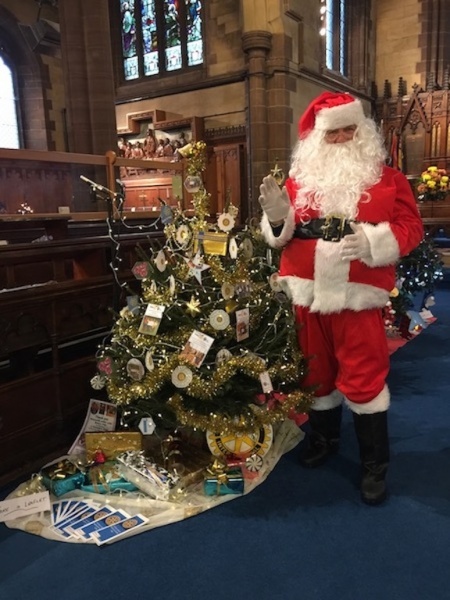 Our decorated tree was one of many displayed at the Christmas Tree Festival within St. Giles Church, Newcastle. Santa is pictured here next to our tree. 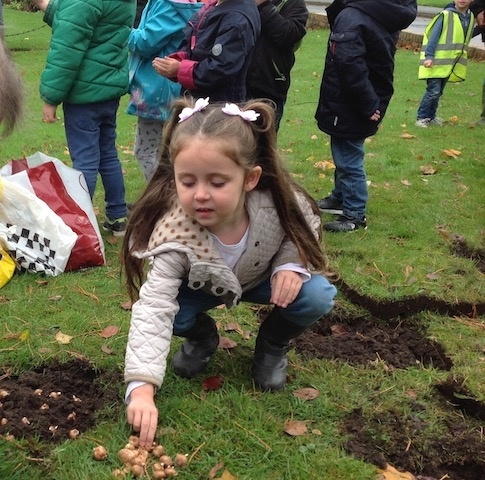 Children from the Norton-in-Hales village school planted more corms at their local St.Chads church to enhance the purple crocus display from earlier in the year. The corms, donated by our club, when in flower will provide a wonderful show of purple and be an excellent reminder of the 'End Polio Now' project. Thanks to Morrisons at Milehouse Lane and the generosity of their customers, our bucket collections over four days in June and July have raised £820. Proceeds will go to support families with vulnerable young children in our local community through the Homestart charity. Many thanks to management, staff and shoppers at Morrisons Goose Street for their support during our Christmas collection which raised £2,353.19. Proceeds will go to The Peter Pan Centre for children with special needs and other charities supported by our club.